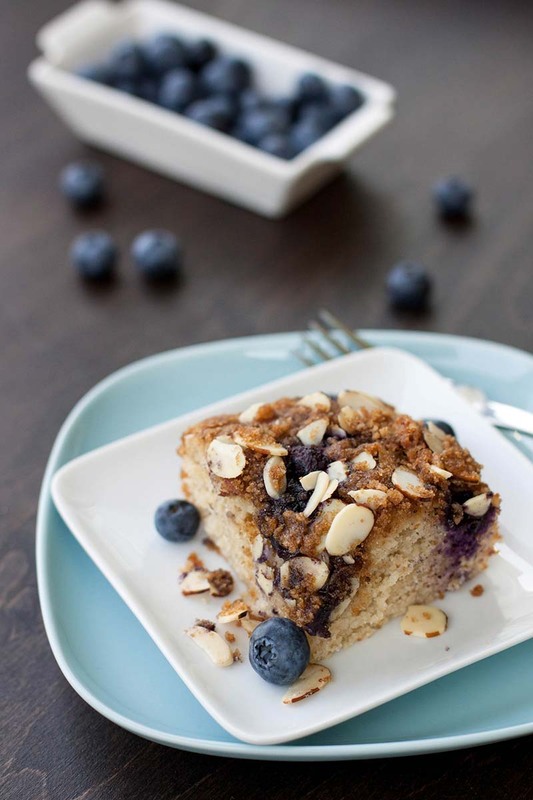 This simple and sweet coffee cake is a family favorite gone gluten-free. Blueberries add a bit of color and make this cake perfect for the warm months of the year. In a mixing bowl, whisk together the sugar, flours - millet, tapioca, almond, and sorghum, psyllium husks, yeast, and salt. In a separate bowl, combine the milk and butter and heat in the microwave until the milk is warm and the butter has just melted (approximately 1 minute on high in my microwave). Stir and add to the flour mixture. Add the egg. Use a wooden spoon to stir the batter until the liquid and egg are incorporated into the batter. Cover with plastic wrap and refrigerate overnight. When you’re ready to bake, preheat the oven to 350°F. Transfer the batter to a lightly greased 8x8-inch baking dish, and cover with plastic wrap. Let the batter come to room temperature (and rise slightly) while allowing the oven to preheat and making the topping. To make the topping, combine the brown sugar, millet flour, and butter in a small mixing bowl. Use a your fingers or a fork to cut the butter into the flour and sugar until the mixture resembles wet crumbs. Stir in the almonds. Just before baking the cake, sprinkle the top of the batter with the blueberries. Top with the crumble topping. Bake for 30 - 32 minutes, until the topping is golden and the center does not jiggle when moved. Allow the cake to cool before slicing. Store leftovers in the refrigerator, covered, for 1 - 2 days. This cake is best prepared the night before. Allowing the batter to rise overnight gives the cake a nice rise and also develops the flavor. For a quick breakfast in the morning, you can prep the topping the night before, too. Simply store it in an airtight container and add it to the coffee cake right before baking.